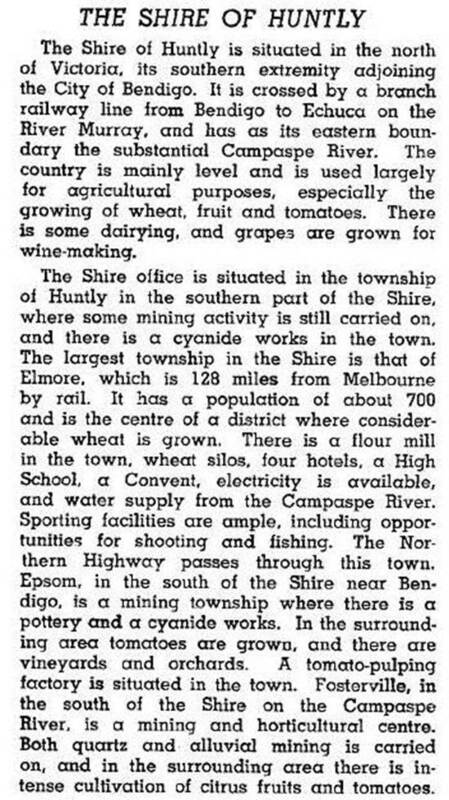 Huntly Shire (1866-1994), north of Bendigo, was proclaimed on 13 July 1866, the successor to a road district which had been created in 1861. It was named after the Huntly parish (1854) which was probably named after Huntly, Aberdeenshire, Scotland. The shire’s south-west corner adjoined Epsom (Bendigo), its eastern boundary was the Campaspe River and its northern boundary ran through Diggora West. Its area was 878 sq km, unchanged since the shire was created. In 1994 farming took up 73% of the shire’s area, on which 7300 cattle, 83,000 pigs and 106,000 sheep and lambs were raised. Nearly 13,000 tonnes of wheat were grown. On 7 April 1994, Huntly shire was united with Bendigo and Marong cities, Eaglehawk borough and Strathfieldsaye shire to form Greater Bendigo city.